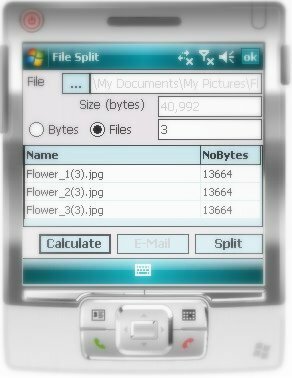 Any File Split & Join Mobile-Quick and easy way for the splitting files into any number of smaller files as well as joining components back into the original file for Windows Mobile devices. The number of files can be entered or calculated based on expected length of individual files (in bytes). Once file components are generated they can be emailed using any of e-mail accounts and to any contact from the contact list. ...... The number of files can be entered or calculated based on expected length of individual files (in bytes). Once file components are generated they can be emailed using any of e-mail accounts and to any contact from the contact list. Any File Split & Join Mobile is performing a binary Split and Join and therefore can split and/or join any file such as: pdf, wav, mp3, xls, rtf, txt, iso, avi, png, jpeg, gif, zip, rar, html, doc, eps, avi, bmp, exe, ico, xml, js, css, etc. Split and rejoin large text or binary files, limited only by open disk space. Qweas is providing links to Any File Split & Join Mobile 3.0 as a courtesy, and makes no representations regarding Any File Split & Join Mobile or any other applications or any information related thereto. Any questions, complaints or claims regarding this application Any File Split & Join Mobile 3.0 must be directed to the appropriate software vendor. You may click the publisher link of Any File Split & Join Mobile on the top of this page to get more details about the vendor.